Harrison Wells was a character who should only have lasted for a single season on The Flash. He should have not been seen again at the premiere of season two like so many single-season villains before him. The reveal of his identity at the midway point of season one was interesting stuff that would have cemented him as one of the better—if not the best—bad guys Barry Allen has ever gone up against. I want to state unequivocally that I am thrilled a version of S.T.A.R. Labs’ original founder has stuck around since the pilot episode. If the character were ever to go away permanently (that can’t happen, this is comics we’re talking about! ), his loss would reverberate across The Flash and into our homes. My sentimentalism aside, tonight’s episode, “When Harry Met Harry,” was definitely designed for Flash fans of a similar ilk. Last season’s addition of H.R. Wells (may he rest in peace), was probably the wackiest version we had seen to date. Harry, of Earth Two, is a stick in the mud—and I love him for it! H.R. was created for no other reason than to stand in stark opposition to Harry and was very successful in doing so. “When Harry Met Harry” takes the possibilities of all the Wellses across the Multiverse and goes absolutely nuts. Please do not read that line as a criticism because it was not meant as such. I believe that each member of the Council of Wells, as Cisco calls them, is an aspect of Harrison Wells’ core characteristics presented in the highest concentration possible. Let’s start with Andy Warhol Wells, as I like to think of him—that’s the white-haired man with the accent, for those playing at home. He’s an obvious riff on the Council of Wells’ intelligence. Each of the three brought to Earth One is highly intelligent, but he is the distillation—running off at the mouth with theorems as soon as they come into his mind as if they might run away should he linger on them for too long. I will contend that Andy Warhol Wells also represents the arrogance that comes with knowing you are always the smartest person in the room when you’re on a show populated with super scientists (Barry Allen, Caitlin Snow, Cisco Ramon). Harry’s arrogance has proven to be his tragic flaw in the past and maybe that’s where this Wells’ ridiculous glasses came from. Then there’s Cowboy Wells. I really dug Cowboy Wells. Apropos of nothing, he’d make an awesome addition to DC’s Legends of Tomorrow. I’d give anything to see him partner up with a returning Jonah Hex to take down some gunslingers. By my estimation, Cowboy Wells is a representation of Harrison Wells’ leadership skills by way of his charisma. He’s the most likeable of the three options we’re presented with and he also knows how to cut and run from a rough situation. When negotiations between the think tank begin to fall apart, he is the first to simply go back to his Earth and concern himself with whatever ongoing narrative he has been living about there in blissful ignorance. However, Cowboy Wells is equally ready and willing to return to Earth One when a second, humbled, appeal for aid is administered by Team Flash. Additionally, it is worth noting that he is the first to apologize for his own poor behavior. Accepting blame and taking responsibility for one’s action is an incredibly mature move and Cowboy Wells doing it first illustrates that he is willing to fall on his sword a little if that repairs the lay of the land. While he might be a clown at first glance, Cowboy Wells proves that he is a great man. Lastly, we come to Robo-Wells. Robo-Wells is my favorite of these new additions to the Council of Wells. If the other two Wells were silly, Robo-Wells is downright absurd and is just a delight to watch in every way. It is evident from the strong acting choices made that Tom Cavanagh had a blast giving this performance. This may be why I was so enamoured with him throughout “When Harry Met Harry.” Robo-Wells is a representation of Harrison Well’s ingenuity. There’s a strong survival instinct that has shaped the course of his life on his Earth and it can be seen in his outward appearance, mirrored by the stories he tells about his life in the place where he came from. 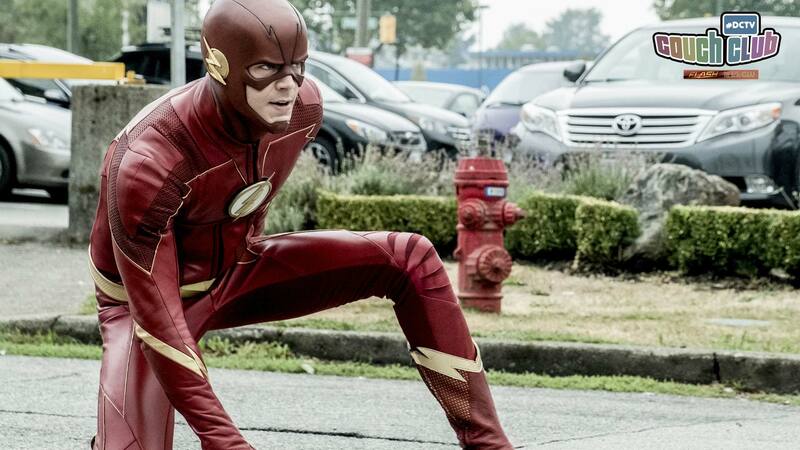 Even though Robo-Wells is the biggest clown in the episode—maybe that The Flash has ever seen—ingenuity is his best quality. In the absence of ingenuity, Barry Allen wouldn’t be the Flash. Meta-humans might have become experiments rather than superheroes. For all the bad that came out of it (and there has been bad, there has also been loss and there has been death), there has been a tremendous amount of good. Team Flash has broken time and fixed it, more than once, under the guidance of a couple of Wellses and it has shepherded in a Golden Age of Heroes. In the wake of Arrow, this universe was a world of vigilantes. That was a good world. I really liked that world. But led by Harrison Wells, it has become something more. So, while “When Harry Met Harry” is titled after a romantic comedy and the three latest versions we’ve met alongside Team Flash are all very funny, the Council of Wells actually had a lot more to teach us about one of the most important characters The Flash has ever created. Let’s jump into the comments and compare notes on our favorite version of Harrison Wells! I want to read your answers!